After the success of the videoclips “El cumple de Pocoyo” (Pocoyo’s birthday), “Un chef genial”( a great chef) and “El reggaetón de los animales” (animal reggaeton) that have accumulated along with their respective trailers more than 22 million views on YouTube, “El Mensaje de Nina” (A message from Nina) has arrived! 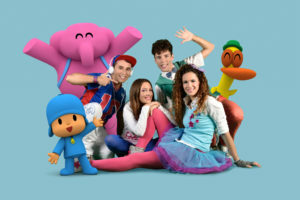 After the success of the videoclips “El cumple de Pocoyo” (Pocoyo’s birthday), “Un chef genial”( a great chef) and “El reggaetón de los animales” (animal reggaeton) that have accumulated along with their respective trailers more than 22 million views on YouTube, “El Mensaje de Nina” (A message from Nina) has arrived! – the new song from Conecta Kids with Pocoyo and his friends. The millions of Pocoyo fans are in luck because this new song is dedicated to Nina, the series new character who joins the adventures of Pocoyo. Nina comes from a microscopic world from which she can enter and leave at will and has the capacity to increase and decrease her size. She is funny, she dresses in green and speaks her own language although it is not a problem for her to communicate with others. Nina is clever, uninhibited and is always followed by her pet, Roberto, the robot. As in the previous videos, for the first time Pocoyo and his friends interact with real life characters in a videoclip. Conecta Kids and Pocoyo have had several previous collaborations. Pocoyo starred in the videoclips of the songs “Conéctate al verano en Clan” (connect with summer on Clan) and “Halloween”, which have accumulated 32 million views on YouTube and at the time, were among the 10 most viewed music videos on Youtube in Spain in 2015. Conecta Kids are currently on tour celebrating Pocoyo’s Birthday in which they sing all their hits with the participation of Pocoyo and his friends in a great show to enjoy with the entire family. 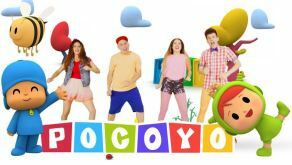 For Christmas Pocoyo and Conecta Kids have planned the release of a joint album, that will include all the songs and videos that they have performed together throughout the year.